Before we start shedding tears at the sad plight of these employers it is important to know a few things about the four decades long shift that has occurred in the labor force. The crackdown on immigration in the US is in essence about controlling migrant workers. It reveals the extent to which the capitalist class oppresses, uproots and divides workers while companies rely on the same workers that the Immigration and Customs Enforcement agents put in cages. For decades the labor costs have been pushed to rock bottom. Wages in the meat packing plants once started at the level that is now the standard wage on the high end of the industry. $16 or $17 an hour was once a starting wage in an industry where the mean wages nationally are at $13.38 as of 2017. The largely Spanish speaking migrant labor force proved to be highly mobile creating a high turnover in employment that was beneficial to the meat processing plants in keeping labor costs down and keeping employees from asking for better terms of exploitation. Nowadays there is greater automation in meat processing, in that robots can do some of the work. But generally in the meatpacking industry here the labor costs are still cheaper than the cost of replacing the workers with machines. Australian meat packing plants for example are heavily automated while those in the US aren't. One worker could be cutting up 30 carcasses at a time with automation. However the work is still highly manual and is generally located somewhere in a region near where the product will be sold. It isn't the sort of industry that can just ship meat on a cargo container ship for six months at a time so it is somewhat geographically bound. Most of the costs of processing meat, despite the labor intensive production methods, aren't costs associated with the variable part of capital. The part that trickles down in the form of wages is small while the cost of land for cattle and transportation are, and still are, going ever higher. It is still a dangerous job, aside from the industry standard of "two amputations a week", there are also consequences in long term nerve damage from carpal tunnel syndrome, from hearing loss and even stress disorders. Often the tools of the job of meat cutting are taken out of a worker's paycheck. The knives used to cut the meat, ideally are made to fit to the hand of the individual meat cutter and are kept properly sharp at all times. This is a basic safety measure but this too becomes a tertiary concern in the capitalist drive to accumulate profit. Workers in the meatpacking industry have a long history of militancy. Many first generation US citizens shaped the famous battles of the Chicago stockyards. Today's precarious migrant workers, often with no legal status, face an even bigger challenge. Where they might take to strike action in their country of origin they don't have the same leeway to fight back in the land in which they are now exploited. Yet recent struggles, notably like that in Matamoros , are encouraging examples from which workers might begin to learn lessons and make a faltering start towards a consciousness of their own collective strength. Whether it's a 'good' firm or a 'bad' firm, when we hear the ideological line from capitalists that "we can't get enough workers" they mean that they don't want to pay the average wages required to get workers to do that particular job. For years, the paternalistic meat packing business established by the Hormel family in 1891 in Austin, Minnesota was run hand in glove with P-9, the local branch of The United Food and Commercial Workers Union. The union even loaned the company money at no interest and agreed to $20 million in concessions to help finance a new $100 million plant that opened in 1982. In exchange, there were loose promises about no wage cuts. While the new plant made meat processing more efficient, it heightened workers' problems. Ham-boners, for example, were required to perform their task 93 times per hour — a rate increase that allowed knife sharpening only on the upswing before a downward plunge into another ham. Rising rates of back, shoulder, nerve and carpal tunnel injuries — and severed fingers — were documented. In 1984 there were 200 injuries for every 100 workers at the plant. When the company demanded a 23 percent wage cut — from $10.69 to $8.25 an hour — to match cuts imposed by other big meatpacking companies, tensions boiled over. An arbitrator six months later told Hormel to raise wages 50 cents to $8.75 but allowed the company to impose retroactive benefit cuts to company-run health insurance plans. 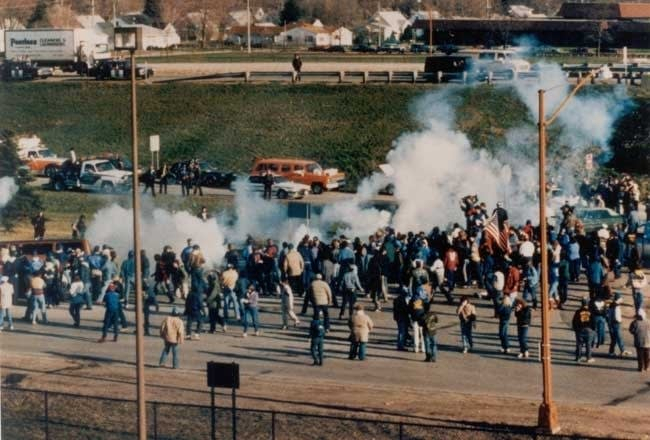 More than 90 percent of P-9 members voted to strike on August 7, 1985. From the start the top union bosses urged them to accept concessions. 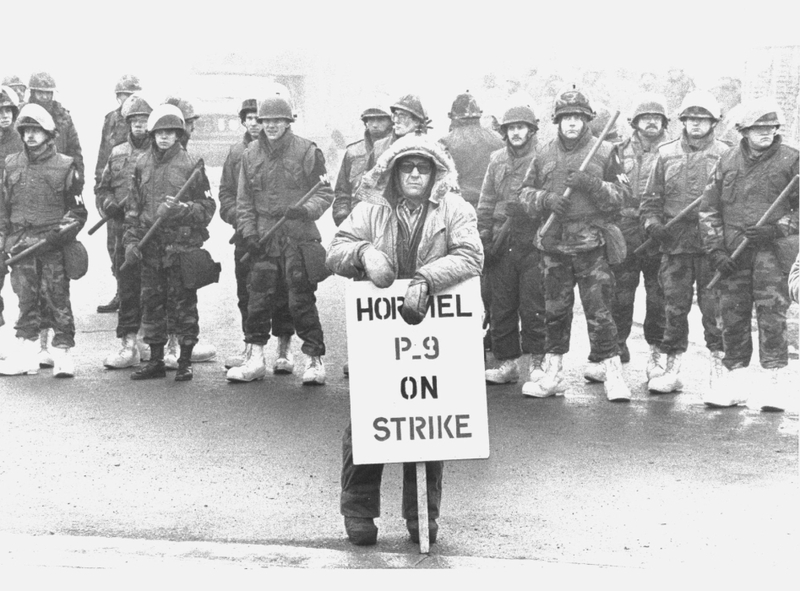 The local branch – P-9 – refused and found themselves organising the strike, including solidarity action at other Hormel plants and eventually facing National Guards called in by the Democratic Labor Party governor, Rudy Perpitch. The strike finally collapsed when the top union bosses pulled any pretence of support by placing the branch in receivership and completely undermining solidarity. Perpitch announced that, "we have saved Minnesota from Communism"
This is a link to a Chicago Trib story about slaughterhouse pollution. The industry also creates a feral pig problem. It should also be pointed out (the author tells us) that migrants got no social security since despite the fact they had to pay into the Social Security program via their payroll tax deductions but could not receive benefits back due to their lack of citizenship and lack of legal documents. So they pay in and can't draw out.